A turning point for Texas' deep-red politics? ... to the upbeat call to action of Pots And Pans, a song inspired by renowned Texas political writer and humorist Molly Ivins. From the humorous advice of Life Of The Party to the poignantly optimistic World Full Of Love, the intensity of Ball's conviction never wavers while, simultaneously, the fun never stops. My favorite left-journalist icon Molly Ivins would be celebrating her birth on August 30th if she'd been lucky enough to survive what she called a “scorching case of breast cancer” that ended her life back in 2007. As a journalist, I've always loved Molly for her wisdom, politics and wicked sense of humor. Did the proposal to put “The Wildflower State” on Texas license plates so offend Texas manhood that it provoked an uproar in the state legislature? (Yes. Molly Ivins wrote a column about it.) Did Nieman Marcus founder Stanley Marcus really scandalize the people of 1960s Dallas when he grew a beard? It's that period of the year when script writers are in demand, kavi kola karayas make a killing, and ingenious artists, singers and four to 8-piece bands are laughing all the way to the bank. Not to forget, the stage and platform makers. And the politicians are at your doorstep pleading for your support. 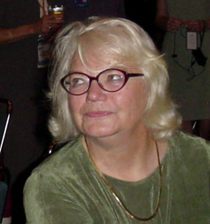 Best-selling author and columnist Molly Ivins talks about her career and cancer at her home in Austin, Texas, May 12, 2001. The sharp-witted liberal who skewered the political establishment died Jan. 31, 2007, of breast cancer. She was 62. (AP Photo/Fort Worth Star-TelegramCarolyn Mary Bauman). Hell, even your plans to govern America can be tumped over, as Molly Ivins wrote in a syndicated column about Bill Clinton in 1993. (Add an “r” to tump, and it happened all over again to Hillary Clinton just last year.) So people can accidentally tump over, and people can intentionally tump things out.